George Will called Cal Thomas a ‘‘moral environmentalist.’’ Thomas is a Christian editorialist who has gained the respect of the political arena. I rely on him to give a Christian perspective of current events and issues. 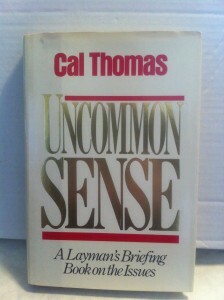 This is a 1990 edition that contains a number of writings on moral issues from abortion to Israel. It is a good buy in the bookstore and it will bring you up to date on topics that you don’t have time to thoroughly pursue.